The Sacred Heart Academy Endowment Fund was established to provide need-based scholarships to SHA students. Gifts to the Endowment Fund help us to reduce tuition for many students to insure that talented young women from every background can afford to make their dreams of a Sacred Heart Academy education come true. While gifts can be made in any amount to the general endowment, donors have the option to establish a scholarship in their name or in the name of one they wish to honor. To establish a named scholarship, a minimum gift of $25,000 is required. Our goal at Sacred Heart Academy is to continue to do everything possible to help families afford a Sacred Heart education. These endowed scholarships are more than dollars, they are priceless investments in our students and they help strengthen our community. May God bless each and every gift made to the Sacred Heart Academy Endowment Fund. All gifts made between July 1, 2017 and June 30, 2018 will be reported in our 2017-2018 Honor Roll of Giving publication in the fall 2018 issue of HEART Magazine. 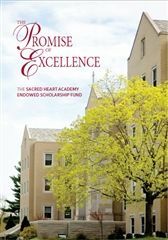 The Promise of Excellence highlights a sampling of our named scholarships, telling stories of love, gratitude, and generosity—stories of the Sacred Heart Academy Endowed Scholarship Fund.